If you’re considering hiring me as a writer, editor or content producer, call 310.497.7157 or via email at ejglickmanmedia@gmail.com. A sample resume is attached, and I will be happy to send an updated resume along with writing samples specific to the publication, project or assignment! 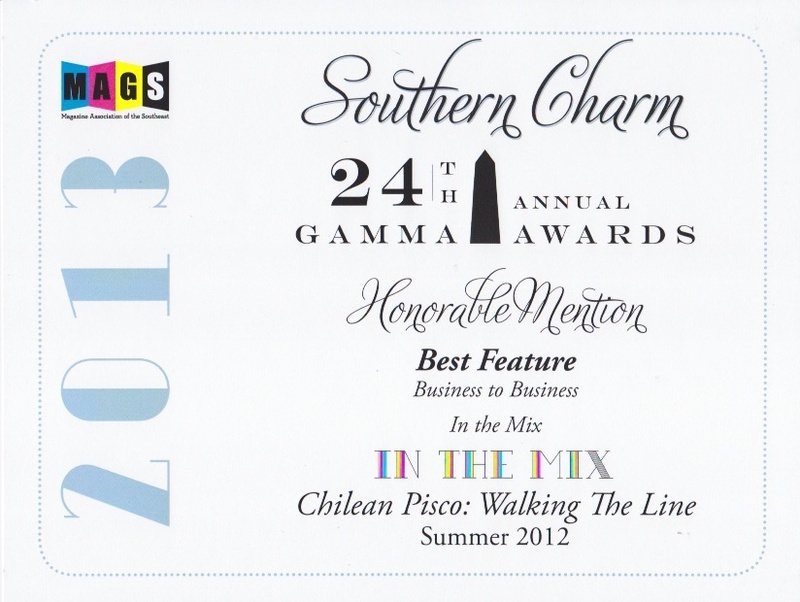 Honorable Mention-Best B-2-B Feature/Gamma Awards, Magazine Association of the Southeast. The following testimonials are from editors who have assigned and published my work and publicists whose clients have been featured in my copy. I have included a bit of everything, as I have found over the years that happy publicists often result in happy clients and happy editors! All I can say is WOW!!!!!!!! And a huge THANK YOU for this!!!! Your story is AMAZING and your journalism is truly beautiful. It takes a gifted writer to describe everything so perfectly. I just can’t thank you enough and I’m sure that everyone at the Boulders will be equally appreciative. And we all hope you will return soon. With thanks and gratitude! Thanks for all your great contributions to the magazine over the years. You have been, by far, the most reliable freelancer I’ve worked with who always produced quality content to boot. -Chris Ytuarte, Editor at Bar Business, 2008-2016. Your feature in Bar Business Magazine (“A League of Their Own,” June 2015) was astonishing! Demi Stevens is a beloved client of ours for multiple reasons, and you magically highlighted all of them! Your writing is impeccable, and while Demi is a tough one to impress, we have to say you blew everyone’s socks off, including hers! Working with you is an absolute pleasure and the entire Melrose PR team looks forward to future partnerships to highlight our other clients just as seamlessly. -Kelley Weaver and Melrose Public Relations. 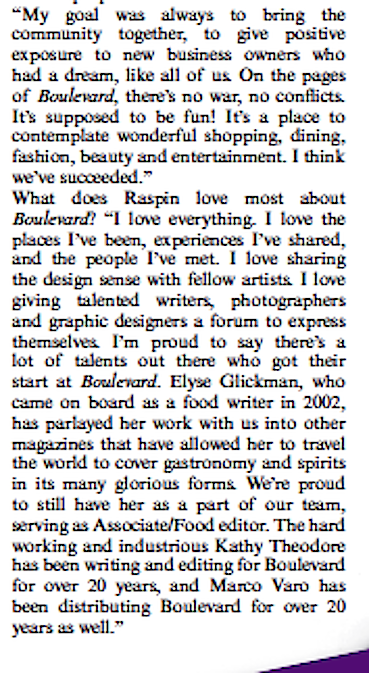 “I’ve worked with Elyse Glickman for the past two years on various client projects and she’s a great contact for any publicist in home design, hospitality and travel, particularly food, restaurants, wine and spirits (please add to this, if needed). When I met her two years ago at Tales of the Cocktail, she took time to tell me about all the assignments in which she was involved, what she needed from a spirits’ client with clear guidelines. I have worked with Elyse Glickman since 2004, when she and joined forces for a story focused on luxury scotch and golf resorts that ran simultaneously in Patterson’s Beverage Journal and Estates West Golf. I was so impressed with her writing, story angles and even photography that I since have hired her back for several of our custom publishing magazines for resort hotels (including JW Marriott, La Quinta and Hotel Del Coronado) as well our Arizona Foothills and Estates West magazine web sites. I believe her versatility and creativity would make her an asset to any lifestyle publication, either in print or on line. I was introduced to Elyse Glickman’s work as a writer and editor via Beverage Industry News, and really enjoyed working with her during our time at Food & Beverage Magazine. While I gave her freelance assignments focused on restaurant industry trends (such as interior design, economy-driven promotions and the evolving industry of food tourism in the U.S.), she had a nice way of making her copy engaging while hitting the necessary business issues. She also did a fine job on pieces that had her traveling to other cities, from San Diego to Calgary to Montego Bay, Jamaica, to show our readership what restaurateurs were doing to get and retain customers in these places. She is also exceptionally good at meeting her deadlines and taking direction when and if rewrites are needed. I just shared your story (“Made in the Shade,” Fresh Cup Magazine, April 2009) with my CEO and told him how impressed I was with your diverse stories and their publications. I also said you were by far the most productive of all the reporters who went on the 3 trips we took to Honduras last year (tourism/hospitality, light manufacturing, and agribusiness). The FIDE people (Honduras) were very pleased with the articles, by the way. I hope one of these days we get another client and a budget for press trips so I can invite you somewhere else! -Kristine Heine, Executive Vice President, Global Communicators, Washington, D.C.
Elyse, I just wanted to say thanks for interviewing me for the BIN article in your coverage (new spirits entering the market). I thought you did an excellent job, particularly with a writing style. 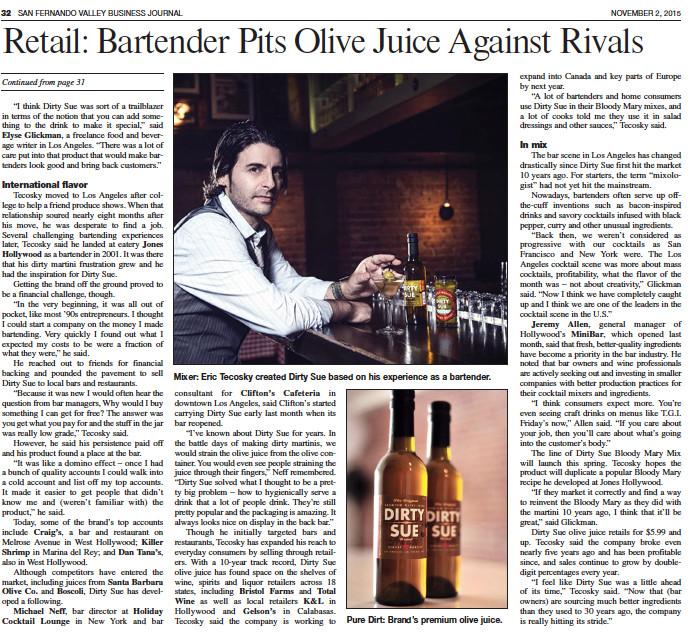 It’s something sorely lacking among the new crop of journalism grads I see, and it’s nice to see standards are still being upheld in the beverage media world. Great seeing you again at the (Canadian Tourism-sponsored Los Angeles Media dinner. You are such a great writer, and these articles on Calgary (in Jewish Exponent, Food & Beverage and Lucire) are awesome! Thanks so much for sending them along. I appreciate it.